For questions or more information about any of our products and services, please email or call us at 877-843-0183. 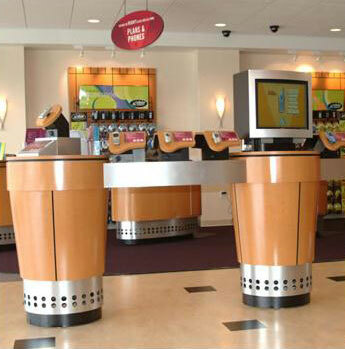 For Convenience Store Design, Walk In Coolers and more, we are your source. Commercial Cabinetry, also know as commercial cabinets or commercial fixtures, are very involved in their design. Commercial Cabinets are made of various substrates to include melamine, plywood, metal, stainless steel, solid surface and plastic laminate. Commercial Cabinets inside a convenience store include Fountain Cabinets, Coffee cabinets, coffee islands, frozen beverage bars, and check-out cabinets. Each of these has a specific purpose and a more specific design! To complicate this even more, cabinets for Grocery Stores Differ from Convenience Stores and cabinets for Liquor Stores Differ from Both Convenience Store Cabinets and Grocery Store Cabinets! Cabinet Design must attend to the specific need for which the cabinet is to be used, for example. 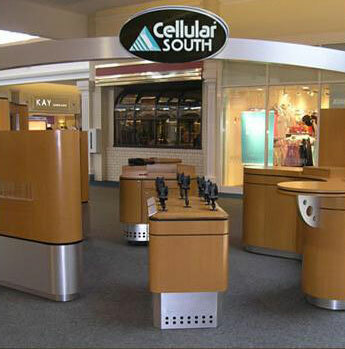 When designing a Fountain Counter Cabinet, we first consider the foot traffic pattern inside the store. We determine the direction of customer flow and then begin the cabinet layout to guarantee that the products are presented conveniently to facilitate access and customer satisfaction. 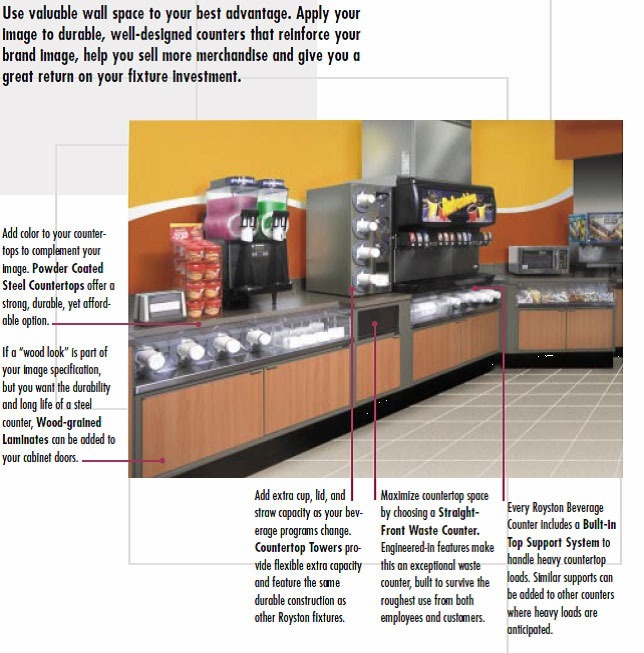 Placement of cup dispensers, napkin dispensers, lids, straws, waste receptacles and condiment areas are important essentials that must be well thought-out to ensure your sales area remains clean and facilitates your customers’ needs while helping you help them! At JayComp Development, convenience store design consultants, we work to achieve the cabinet system that you want; so to achieve this, we carry several lines with Three Key Manufacturers. Our convenience store shelving and retail shelving includes: Royston cabinets, Royston shelving, Shopco and infinitidecor. Give us a call, and we can help with your cabinet design!